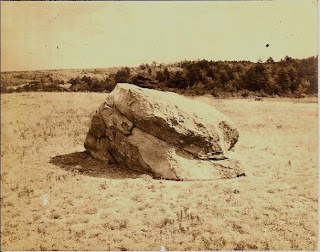 One of Middleborough's genuine pieces of folklore centers about the Hand Rock, a granite rock which sits atop Indian Hill off East Main Street in Middleborough. Incised into the surface of the rock is the imprint of a hand, its fingers splayed wide. One of the best known Native petroglyphs (stone carvings) in the area of Middleborough and Lakeville, the impression of the hand upon the rock is held by local legend to have been created when a Native was shot and killed, his hand striking the rock and mystically leaving the depression. A handwritten record in the possession in 1952 of Alice H. Cornish, a descendant of John Tomson, recounts the circumstances of the folk tale. At the outbreak of King Philip's War in the summer of 1675, most Middleborough residents had sought refuge in the relative safety of the garrison or fort located in the vicinity of the rear of the former Memorial Junior High School on North Main Street. The growing hostility of the Natives towards the garrison and their increasing boldness eventually became intolerable for the English sheltered inside. The Indians would daily appear on the south side of the Nemasket river, opposite the fort, and taunt those in the garrison with insulting gestures. Lt. [John] Thompson ordered Isaac Howland, a distinguished marksman, to take the long gun and shoot one of the Indians. This he did while the savage was on the rock insulting them. The distance from the garrison to the rock was 155 rods, nearly half a mile. Though neither this record, nor the numerous other historical accounts of the event make specific mention of the hand print in connection with the shooting, local folklore has always connected the two, the handprint being the consequence of the shooting. The boulder is a glacial erratic composed of fine-to-medium grained granite. It measures 2 meters (6.8 feet) in length from north to south and 2.5 meters (8.5 feet) wide from east to west. On its north side, the boulder is 110 centimeters (42 inches) in height, but the rock slopes downward to a height of 80 centimeters (30 inches) at its south end. The hilltop on which this petroglyph rock sits is generally clear at the top, but the side slopes are wooded. The handprint-and-wrist symbol has been pecked into the surface of the rock. The design is naturalistic and represents a right hand. It measures 26 centimeters (10 inches) in length from the tip of the middle finger to the bottom edge of the wrist. The fingers are extended and splayed and point to the north. The maximum width of the handprint is 21 centimeters (8 inches) when measured between the thumb and small finger. The depth of the pecked design ranges from 4 to 6 millimeters (0.2-0.25 inches). When Lenik visited the site in 1978 to document the Hand Rock, he found that "the boulder and handprint carving have been considerably defaced. The rock has been splattered with paint, and intials have been carved into its surface. The handprint-wrist symbol was reportedly enhanced in the mid-1930s by local boys who "deepened it a bit" to make it more visible but did not change its outline". The imprinted hand has long held a certain local fascination, mainly from the folk tale which describes its creation. While Lenik writes that "the existence of the petroglyph boulder has been known since at least 1906", certainly the Natives knew about it when they chipped the hand pattern into it. Similarly, non-Native knowledge of the petroglyph also predates 1906, though with no certainty can we ascertain as to who first became aware of the rock or when. The Barden family may have been among the earliest to be familiar with the rock, owning much land in the vicinity if not the rock itself. Nehemiah Bennett left a description of Middleborough dated 1793 in which he mentions "a rock on a high hill a little to the eastward of the old stone fishing weir, where there is the print of a person's hand in said rock". [Massachusetts Historical Collections Vol. 3d 1810] It is likely that by that time the land atop the hill had been cleared, exposing the rock with its handprint to all who cared to look. In 1853, the editor of the Namasket Gazette Samuel P. Brown visited the site and published a description of the rock in his newspaper, the account indicating that by the mid-19th century the Hand Rock was well known among local residents. Curiously, however, Brown makes no mention of the obvious handprint upon its surface. It may not be new to most of our readers, that the rock on which the Indian was killed by the "long gun," away back in the "Old Colony times," is within about half a mile of the "Four Corners," and is within sight from many points in Main street. With a friend we went on Monday last week, to see it. It is not as large as our imagination had made it: but it is on the top of a pretty good sized hill, and was not so mean a prominence for the sharp shooting marksman, as it was unfortunate for the Indian who so impudently and imprudently mounted it to be shot down. The place where the aim was taken, we visited too, or what is said to be the place. It is on this side of the Namasket, and at nearly the same elevation from it, as the rock upon the other side. The gun is now the property of Captain Zadock Thompson, of Halifax, and is one of the old English guns, of the longest make. ["Indian Rock", Namasket Gazette, May 20, 1853, p. 2]. At the time, the incident of the shooting of the Native was one which was frequently commemorated. About 1820, "the performance of shooting the Indian was celebrated here in grand style, the English occupying this side of the river and the mock Indians the other side, the same gun being used for the occasion, and an Indian feinted the process of tumbling from the rock. An oration suitable for the occasion was delivered ...." ["Indian Rock", Namasket Gazette, May 20, 1853, p. 2]. Likewise, the centenary celebration of the town in 1869 once more witnessed the reappearance of the Tomson gun which was displayed with much reverence. The rationale behind these commemorations was largely one of historical identity as the episode was seen as "one link between the present and the past history of the town." Increasingly, however, less attention was paid to the shooting incident than to the handprint itself, which was recognized as but one of several petroglyphs in the immediate area. Although Weston refers to the rock as the "hand rock", he makes no assertion regarding the imprint's origin. As awareness and appreciation for Native history accelerated in the 20th century, new perspectives, including that of Lenik, began questioning both the origins and meanings of these carvings. Ultimately, the petroglyph is less supernatural in origin than local folklore would have it, having been chipped slowly into the boulder over a period of time. Lenik himself suggests that "the handprint is that of a shaman who has marked the area as a sacred site. The boulder, standing alone on the hilltop, may have been seen as a source of spiritual power. The carving of the handprint may have been a shaman's attempt to derive power from the site." Lenik is likely right in his surmise that there was some enduring connection between the hill and the Native population. The English choice of the name "Indian Hill" for the location of the Hand Rock indicates that even they recognized (though perhaps did not understand) the deep connection between the Natives, the hill and the Hand Rock. Hand Rock, photograph, from Thomas Weston, History of the Town of Middleboro, Massachusetts (Middleborough, MA: Town of Middleborough, 1906), p. 77. 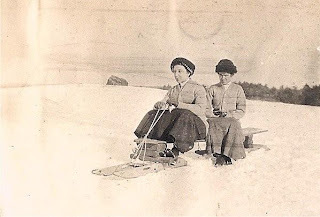 Louise Pratt and Rose Standish Pratt, with the Hand Rock in the background, photograph, c. 1910. Louise Pratt and her brother, Ernest S. Pratt, grew up on the Pratt Farm on East Main Street (now the Pratt Farm Conservation Area) and were undoubtedly familiar with the Hand Rock as Indian Hill was a favorite coasting site for residents of the area. Tomson Long Gun, etching, from Thomas Weston, History of the Town of Middleboro, Massachusetts (Middleborough, MA: Town of Middleborough, 1906), p. 76. The gun belonging to Lieutenant John Tomson was described in Weston's history as being "seven feet, four and a half inches long; the length of the barrel, six and one half feet; the size of the caliber twelve balls to the pound, and the length of the face of the lock ten inches. This gun, weighing twelve pounds, was probably brought from the old country." The gun remained in the Thompson family for a number of generations and is now part of the collections of the Old Colony Historical Society in Taunton, MA. "Indian Rock", Namasket Gazette, May 20, 1853, p. 2. Edward J. Lenik, "Sacred Places and Power Spots: Native American Rock Art at Middleborough, Massachusetts", 25-37, in Occasional Paper 2, Rock Art of the Eastern Woodland, Charles H. Faulkner, ed., American Rock Art Research Association, 1996. Edward J. Lenik, Picture Rocks: American Indian Rock Art in the Northeast Woodlands (Hanover, NH: University of New England Press). Massachusetts Historical Collections, Volume 3d, 1810. Thomas Weston, History of the Town of Middleboro, Massachusetts (Middleborough, MA: Town of Middleborough, 1906). Growing up in Middleboro I'd heard of legend of Hand Rock for many years. Finally, as a teenager, I found someone who knew about it to lead me to it. I couldn't believe it! There really was a hand imprinted in the rock. That memory had become murky over time - thanks for this post to clear away the dust. Can the public still view the rock? Also, I was surprised to learn that there is a similar legend in Plymouth - and a similar rock - along what was a dirt road in the 90's. Near what is Pine Hills now. It is very sad that people have vandalized the rock and added to the carving. It is another example of how Native sites are considered not worth protecting while anything colonial is well preserved. My 10yr native daughter wants to see the rock...imagine how I am supposed to explain the disrespect to our history. I saw the rock once about 25 years ago, I remember laying my hand across the handprint and wondering about it. Last night for some random reason I thought about it in a dream so I typed in rock + indian + handprint + middleboro and found it! glad to know there was more to this than vague memories! I lived on Fairview St. and later Archer Court late 1950's early 1960's, I remember my older brother taking me to the rock, it fascinated me as a 6-8 year old boy. He also used to tie a rope around my waist and have me walk out on the river to test the ice in winter...not so fascinating.